What Can Tarot Card Readings Online Tell You? Have you ever wanted to get clarity on an issue in life, love or business? The Tarot is a divination tool and an amazing, profound process. When a reading is given, pathways and options open up on which direction to take when you seek answers and guidance. Tarot cards are not about a fortune-telling gypsy telling you about impending doom. They're not meant to tell your fortune or future. The Hermetic Order of the Golden Dawn states, "The most powerful sources of information come from within; the Tarot aids in coming in contact with one's Higher Self." When we consult the Tarot, we are connecting with the Supreme Intelligence that is within all of us. How Does Tarot Card Readings Online Work? When you book your reading, you will put your energy into the question at a certain specified time of day that we agree upon. The Tarot Cards are shuffled at that time and the spread is laid out. 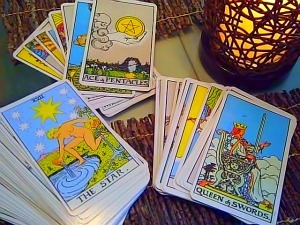 I then read the cards, translate their meanings pertaining to your questions, and email your detailed report. This can also be done live, over the phone. Tarot Love Readings - Geared specifically towards questions regarding your love life and when you are seeking answers regarding your mate. For singles, this reading will help you recognize your next partner and determine romantic potential. Angel Tarot Readings - Your Guardian Angel will be presiding over this reading. A minimum of one hour is required for this reading. I will need a birth date. Your Angel's name will be given in addition to your full reading. The Angel Tarot Reading will be a way for you to connect to your Angel on a personal, spiritually energetic level. When consulting the Tarot and asking your question, only include the minimum level of detail needed in order to express what you want to learn. If the reading is for yourself, make sure your question focuses on you rather than someone else who you think may be the cause of your problem. Your question has to be neutral and not convey a preconceived notion that YOUR view is the right one. The cards will give you guidance. Your question should be stated in a positive way. Don't ask why a specific event hasn't happened, ask how you can make that event happen. These are just some basic guidelines to help you get the best possible reading. Tarot card readings online will uncover the hidden challenges that are in your way and create a crystal clear vision of what you need to do to bring about your desired results. Use my Contact Form to begin. Let's work together to unblock the energies waiting to be freed to chart the best course for you.